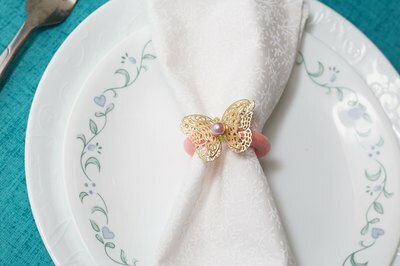 Napkin rings seem like such a small thing, but they add so much to the look of your table. 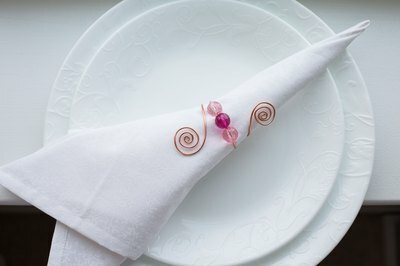 Depending on the style you choose, a napkin ring can make a very different statement about the event: buttons for a homey look, jewelry to feel fancy or even fresh flowers in honor of the season. 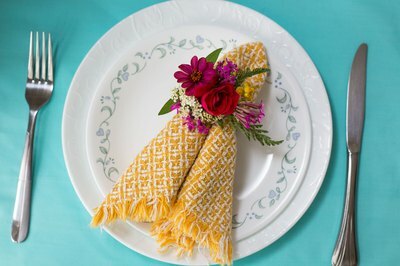 Whether you're throwing a dinner party, decorating for a wedding, or just want your meals at home to feel a little bit special, napkin rings can set the perfect tone. String the cord through each of the buttons, alternating colors and styles. Make sure to lay the buttons flat and overlapping them slightly, rather than pulling the cord tight so that the buttons turn upright. 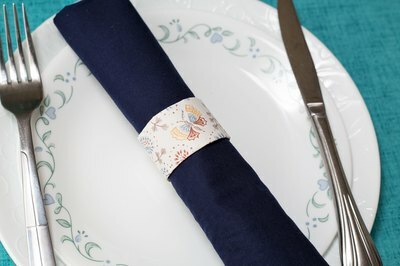 Roll up the napkin and check to make sure the length of the cord fits comfortably and around the napkin. Cut the cord and tie it in place around the napkin. Wrap the wire around the paper towel roll three times to make a spiral. Cut wire, then carefully remove it without pulling it out of shape. Using the pliers, bend one end of the wire to make a small loop. Thread the beads onto the spiral wire, then bend the other end of the wire into a loop. Fold the loops down, then press them tightly with the pliers. Cut any tail wires. Select three colors of embroidery thread. Holding the 3 colors together, wrap them tightly around the wooden ring several times until you can tug at them without pulling them off the ring. Take your first color and wrap it tightly around the ring, covering your set-up wraps. Continue wrapping this color to form the first color block, holding your other 2 threads underneath. Change to your second color block, and wrap using the second color, continuing to hold the other two threads underneath. Change to your third color block, and repeat until the entire ring is wrapped. Cut your thread on the inside of the ring and hot glue it in place. Remove any pins from the brooches with the pliers. Mix up the epoxy and apply it to the back of the brooch and to the napkin ring. Tape the brooch and napkin ring together until the epoxy dries. Cut the fabric into 2 by 6 1/2-inch strips. Fold one lengthwise end of the fabric in by 1/2 inch and glue it in place to form a hem. Cut the paper towel rolls into 1 1/2 inch pieces to form your rings. Place fabric glue on the inside of the ring at both to top and the bottom and wrap your fabric around the ring. Press the fabric into the glue and hold it in place until it dries. Tear the pages into 1 inch by 3 inch strips. 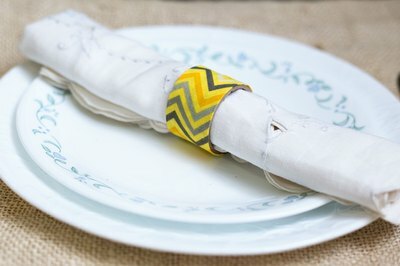 Paint the strips onto the napkin rings using the decoupage glue, and layer them as you go so that the entire ring is covered. 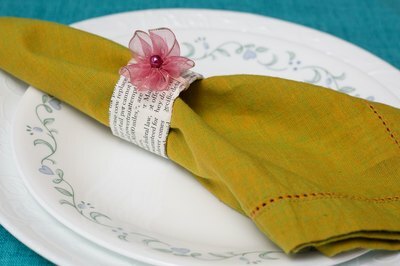 Wrap the pages over the edge of the napkin ring and glue them in place on the inside to cover the edge. Let it dry. Trim your flowers to a 3-inch stem and remove any excess leaves. Place one flower against the ring and wrap it in place with the floral tape, stretching it to activate the adhesive. Layer another flower over it and wrap it in place as well. Repeat until two-thirds of the ring is covered. Wrap the remainder of the ring in floral tape. Cut a 6-inch long length of ribbon, and trim one end at a diagonal. Wrap the other end of the ribbon around both D rings and glue it in place. 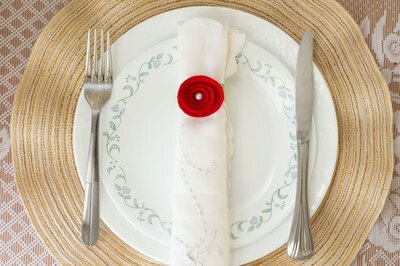 Roll a napkin and place it in the center of the ribbon. 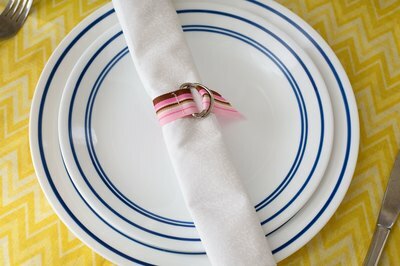 Wrap the ribbon around the napkin and thread it through the D ring. Pull it tight. Cut a 5-inch long by 2-inch wide piece from the wallpaper sample. Place a rolled napkin in the center and overlap the edge of the sample slightly. Glue it in place. Cut a 7-inch length of ribbon and tie it neatly around the ring. Cut a felt circle 3 inches in diameter. Cut a spiral from the outer edge to the inside of the circle. Starting at the outside, roll the spiral tightly to form the flower. Hot glue it in place. Cut a 5-inch by 2-inch strip out of the second felt color. 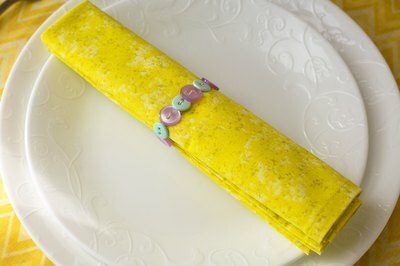 Overlap the edges by 1/8 inch and sew them together to form the napkin ring. 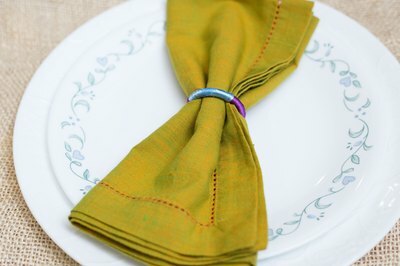 Sew the flower to the top of the napkin ring. 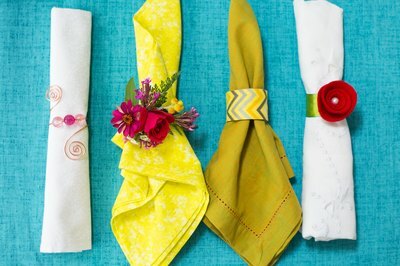 You can further embellish any of these with fake or dried flowers, dried leaves, or whatever comes to mind!